This necklace is a fun variation of our Free Crochet Bracelet Class. We started off by fusing some 14 gauge Fine Silver wire into a square shape and then crocheted some 26 gauge sterling silver wire for the inside. This necklace has a lot of texture, dimension and beauty. Mix and match your metals to get an even bolder look! Start with 14 gauge Fine Silver. It is possible to make it thicker, but we would not recommend going any thinner than 14 gauge, because the frame might not be strong enough to hold the shape. Bend the wire into a square shape. Then check out our Introduction to Fine Silver Fusing class, and fuse the shape together. Next take chain nose pliers and make sure the shape is just right. Angle the corners and straighten up the frame to ensure that it is crisp and angular (this is important because the corners will round out as the metal is texturized and hammered out). Next use a chasing hammer to hammer out the silver. This will flatten out and texturize the shape. It will also work-harden the metal, since after fusing, metal gets very soft and malleable. Set the fine silver frame aside. 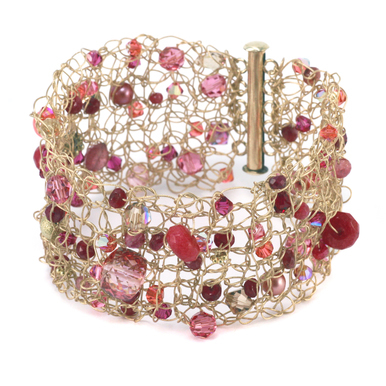 Then take 26 gauge wire and check out our FREE: Crochet Bracelet class. Leave a portion of wire (approximately 12 inches) at the start. This will be useful when attaching the finished crocheted section to the frame. Crochet a square shape that is smaller than the fused frame. This way the crocheted section will stretch into place. Leave a 12-15 inch section of wire at the end of the crocheted square. Make sure to finish off at the diagonal corner from the starting point. This way the two excess wires are evenly spaced in opposite corners of the frame. Take one wire and loop it through both the frame and the crochet piece. Continue to loop "stitch" the wire until two sides of the frame are complete. Double loop it at the end and pinch it close to the frame, then cut the wire. Pick up the other wire to loop "stitch" the other two sides. After cutting and looping the last of the wire around the frame, take two jump rings and attach the chain to finish the piece. Soldering Starter Kit - $99.00 - Even though we used fusing to complete our square frame, the Soldering Kit includes much of what you will need to fuse; pretty much everything is necessary except the soldering paste. 26g Sterling Silver Round, Dead Soft Wire -1/2 oz (~38.5 ft) - $23.27 - Sterling Silver is great to crochet with since it is nice and maleable, but other metals, like silver fill and copper will work as well. Silver Filled Rolo Chain, 2.5mm x 2.5mm, by the inch - $0.39 - Feel free to customize the length of your necklace. This chain is sold by the inch, so you can make it a choker, or a belly duster!